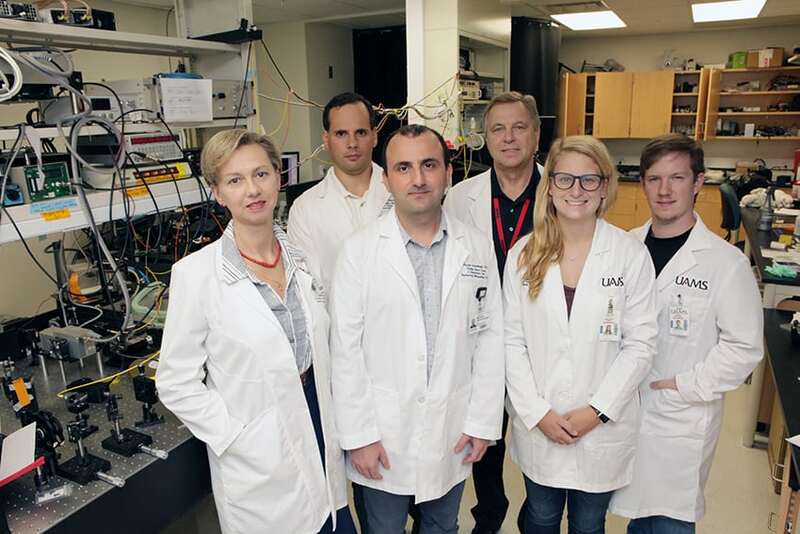 The research team whose article titled "Spaser as a Biological Probe" was published in the June 8 issue Nature Communications includes (left to right) Ekaterina Galanzha, M.D., Ph.D.; Dmitry Nedosekin, Ph.D.; Mustafa Sarimollaoglu, Ph.D.; Jaqueline Nolan; and Water Harrington. 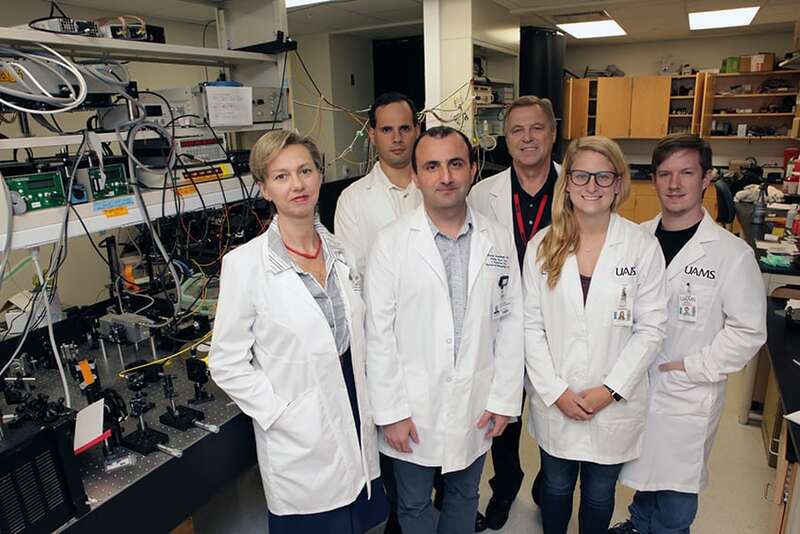 June 8, 2017 | LITTLE ROCK — A University of Arkansas for Medical Sciences (UAMS) research team led by Vladimir Zharov, Ph.D., D.Sc., has demonstrated the ability to kill single cancer cells using the world’s smallest laser. At 22 nanometers in diameter, the laser — known as a spaser — is capable of detecting and killing single cancer cells by generating super-bright light directly in the cells and transforming the light into heat, nanobubbles and sound waves. One nanometer is equal to one billionth of a meter. The research team whose article titled “Spaser as a Biological Probe” was published in the June 8 issue Nature Communications includes (left to right) Ekaterina Galanzha, M.D., Ph.D.; Dmitry Nedosekin, Ph.D.; Mustafa Sarimollaoglu, Ph.D.; Vladimir Zharov, Ph.D., D.Sc. ; Jacqueline Nolan; and Walter Harrington. The team’s findings titled “Spaser as a Biological Probe” were published in the June 8 issue of Nature Communications, a prestigious online scientific journal published by Nature Publishing Group. Zharov is director of the Arkansas Nanomedicine Center at UAMS and a professor in the UAMS College of Medicine Department of Otolarynology-Head and Neck Surgery. “The use of lasers has revolutionized disease diagnosis and treatment. However, the large size of lasers has prevented their use in many medical applications at the cellular level,” said Zharov, who in 2003 pioneered the use of laser-induced vapor nanobubbles around overheated plasmonic nanoparticle clusters to kill single tumor cells without harming neighboring normal cells. 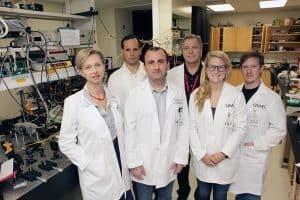 “Researchers under the direction of Dr. Vladimir Zharov have used this technology in a novel and exciting way to detect and destroy circulating cancer cells with new precision. These cellular probes can likewise be bonded with compounds, such as folic acid, for molecular targeting of individual cancer cells in a therapeutic fashion without interaction with normal cells. This exciting research may eventually allow detection and treatment of cancers cells before they have the chance to metastasize,” said John Dornhoffer, M.D., chairman of the Department of Otolaryngology – Head and Neck Surgery in the UAMS College of Medicine. The extremely small size of the spaser — which stands for Surface Plasmon Amplification by Stimulated Emission of Radiation — overcomes these limitations and has shown the potential both to diagnose and treat cancer at the cellular level. Moreover, Zharov’s team has discovered a new principle of pulse laser using transient vapor nanobubbles around the spaser as part of a laser schematic leading to giant generation of spaser light. The research team has demonstrated a laser regimen with an emission intensity and spectral width more than 100 times brighter and 30-fold narrower than for quantum dots. Quantum dots are one of the best tiny, man-made probes that display unique optical properties. While quantum dots used as diagnostic nanoprobes are important to understanding cell biology, toxicity, light attenuation in tissue and other concerns limit their application in humans. Because the spaser’s super-brightness and its components have low toxicity, it shows more promise for potential use in people. “According to our data, spasers are small enough so as not to adversely influence cell functions, specific enough to target desired cells, bright enough to be detectable in complex biological backgrounds, and plasmonically active enough to generate the desired photomechanical therapeutic effect that can kill tumor cells, such as triple negative breast cancer cells that are resistant to conventional chemotherapy,” Zharov said. Zharov’s research is funded by the National Institutes of Health, the UAMS Translational Research Institute, and the National Science Foundation’s Instrument Development for Biological Research and Experimental Program to Stimulate Competitive Research programs. UAMS scientists collaborating on the research were Ekaterina I. Galanzha, M.D., Ph.D., D.Sc., associate research professor; Dmitry A. Nedosekin, Ph.D.; and Mustafa Sarimollaoglu, Ph.D., both research associates, all in the Department of Otolarynology-Head and Neck Surgery and Jacqueline Nolan and Walter Harrington, both graduate students in the UAMS Interdisciplinary Biomedical Sciences Graduate Program. Additional researchers on the study included colleagues from the Center for Integrative Nanotechnology Sciences at the University of Arkansas at Little Rock, Georgia State University and Russia.